El Niño conditions continued for a sixth straight month and forecasts and the most recent outlooks offer a consistent cluster of forecasts calling for a clear El Niño signal similar to past strong events, lasting into early 2016. Forecasts focused on the persistence of sea-surface temperature (SST) anomalies (Figs.1–2) and on weakened trade winds, ongoing convective activity in the central and eastern Pacific, and El Niño-related ocean-atmosphere coupling. 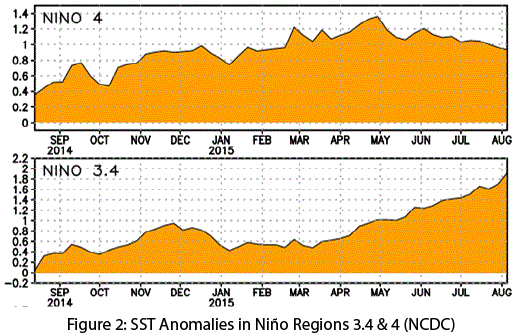 On August 10, the Japan Meteorological Agency identified persistent El Niño conditions in the equatorial Pacific, especially SST anomalies and convective activity, and forecast that the current El Niño conditions were likely to persist until winter. On August 13, the NOAA-Climate Prediction Center (CPC) extended its El Niño advisory, predicting more than a 90-percent chance that El Niño will continue through winter 2015–2016 and an 85-percent chance it will last into early spring 2016 (Fig. 3). The center cited persistent positive SST anomalies in the central and eastern Pacific and ongoing ocean-atmospheric coupling and convection activity as indicators of an ongoing and strengthening event. On August 18, the Australian Bureau of Meteorology maintained its tracker at official El Niño status, identifying a strengthening El Niño with strong ocean-atmosphere coupling and projecting the event is likely to persist into 2016. 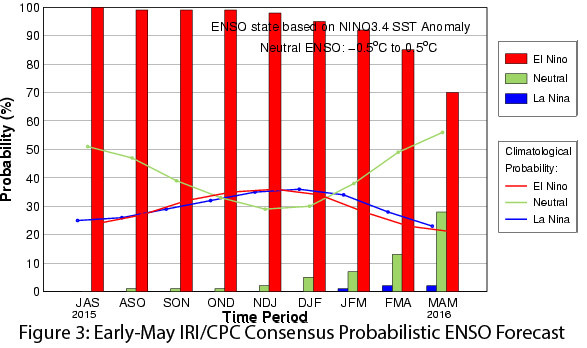 On August 20, the International Research Institute for Climate and Society (IRI) and CPC forecasts indicated the persistence of strong El Niño conditions, with possible further strengthening during fall 2015, and extending well into spring 2016. 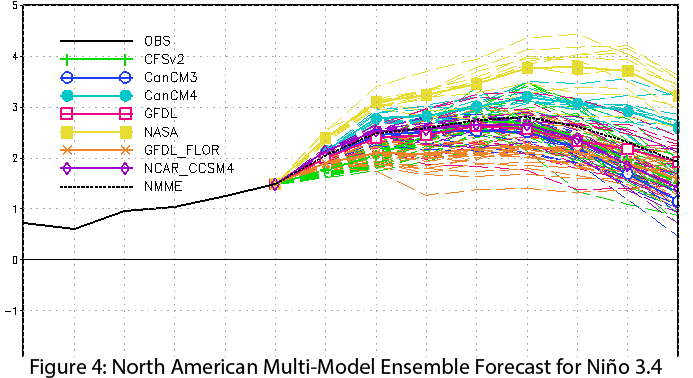 The North American multi-model ensemble currently shows a strong event extending into 2016 (Fig. 4). Given that the current and projected strength of the El Niño is strong with no sign of weakening, emergent questions have centered on how this event compares to other strong events such as those in 1982–83 and 1997–98. Limited data makes comparisons and statistical analyses more difficult, and each event has a unique context that affects its impact. If El Niño remains on this trajectory, it most likely will be one of the top three or four strongest events on record since 1950, with implications for both Southwest and global communities. Sensationalistic media coverage already has begun (see recent coverage of “Godzilla” El Niño), but it will be important to temper expectations without minimizing possible impacts. The general consensus is that a strong El Niño extending into winter 2015–2016 would likely bring above-average winter precipitation in the Southwest (Fig. 5), particularly later in the season. 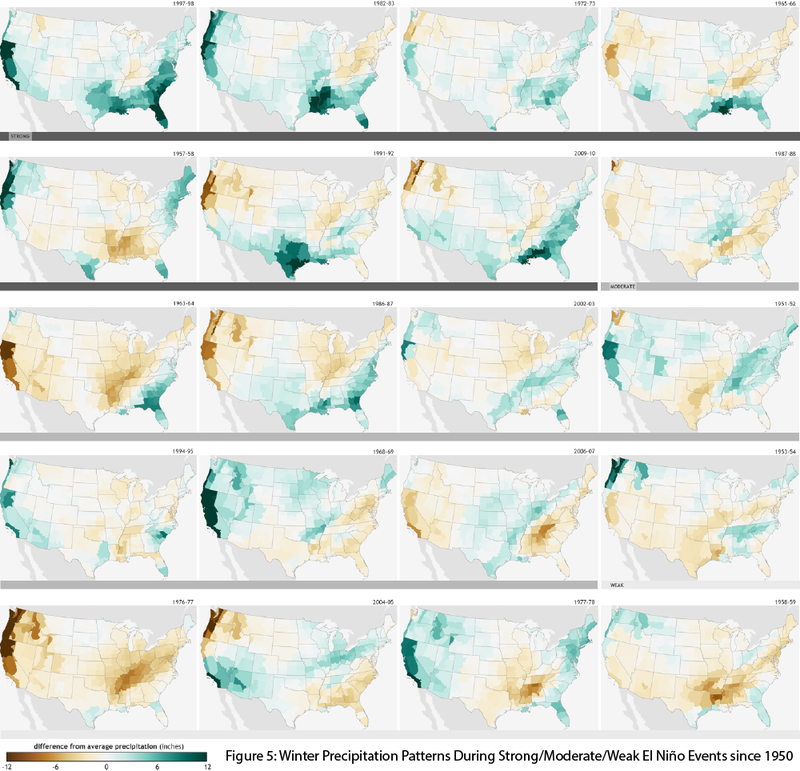 It is important to note that this relationship suggests that a strong El Niño event gives the Southwest a much better chance at increased precipitation totals by March or April, but it is far from a guarantee of increased precipitation. Current CPC forecsts do indicate increased an chance of precipitation in late fall and early winter, but the region could very well see a relatively dry period through early 2016 following the close of the eastern Pacific tropical storm season; this would not necessarily mean that El Niño was a “bust.” In the more immediate future, El Niño conditions could lead to a repeat of 2014’s above-average eastern Pacific tropical storm season, when conditions favorable to El Niño were thought to be driving increased tropical storm activity in the Southwest in September and October.